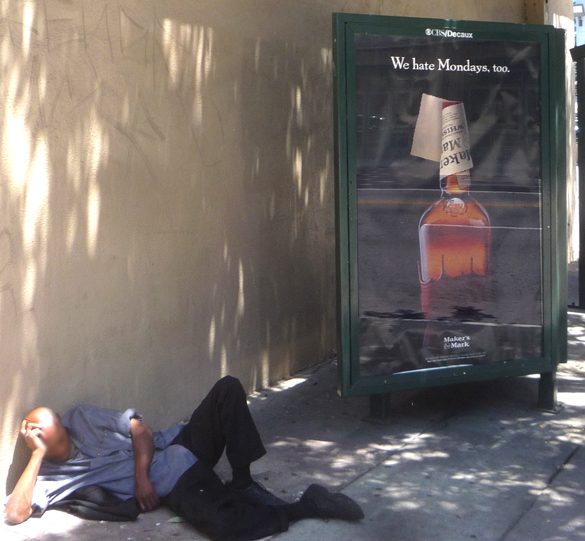 Maker's Mark whiskey ad on "public amenity kiosk" on downtown L.A. Street. The area has the city's highest rates of alcoholism and homelessness. 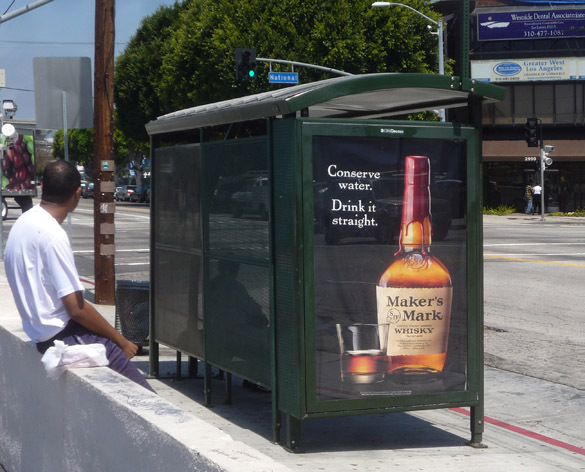 Bus shelters and other items of street furniture have displayed ads for such alcoholic beverages as whiskey and tequila even though city policy prohibits ads on public property for tobacco products or hard liquor. 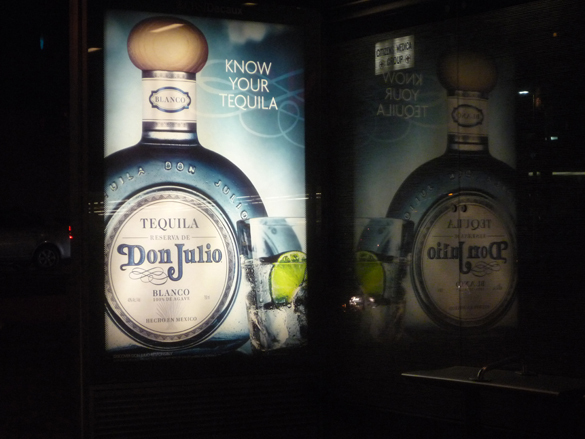 The company, CBS/Decaux, has not only displayed ads for hard liquor in bus shelters and on “public amenity” kiosks, but has placed such ads within the 500 ft. limit around churches and schools. In addition, movie ads with depictions of actors brandishing guns have been placed in close proximity to schools, in one case within yards of the spot where a student was fatally shot in the aftermath of a fight. CBS/Decaux is a joint venture of CBS Outdoor and the French company, JC Decaux. Both are among the world’s largest outdoor advertising companies. The city contracted with CBS/Decaux in 2001 to install 3,350 bus shelters, kiosks, and automated public toilets over a 20-year period in exchange for a minimum of $150 million in revenue. To date, approximately 1700 items have been installed. Bus shelter on Sepulveda Blvd. in West L.A.
Tequila ad in bus shelter less than 500 ft. from synagogue and hebrew school on LaBrea Ave.